In this day and age you’d think the airlines would have it all figured out when it comes to shipping golf clubs, people and cargo without damaging any of it and yet that still doesn’t seem to be the case. 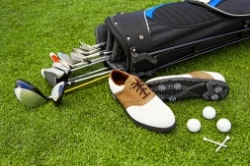 In an attempt to get at least your golf clubs to your destination without them being broken, bent or otherwise damaged, we’ll provide you with some tips here that should work in your favor. 1. Invest in a decent travel bag. This is a bag that your golf bag and clubs go inside of. Purchase a well-made travel bag for your clubs – either a hard shelled or soft sided bag. Go online and read reviews about the different types and brands of bags and then invest in the best one you can afford. Believe us when we say it will pay for itself tenfold. 2. We recommend when you pack your clubs you secure all the same height clubs together, then protect the ends with something secure like clothing or towels, and secure them tightly. Check with the airline guidelines in advance to see what restrictions may be placed on what you can pack with your clubs. There will likely be weight restrictions. 3. If you have the option to ship your clubs rather than fly them to your destination you might want to consider doing that instead. 4. Label everything securely and not just the outer travel bag. You can’t have too much ID on your bags and clubs should they come up missing. 5. Avoid stop over’s during your flight if you can help it. Even if it means paying a little more at least you won’t have the worry about whether your clubs make it to the right plane or not. 6. Because weight matters, only bring the clubs you know you use the most. It’s simply not necessary to bring all 14 clubs. Bring just a dozen balls and just one pair of golf shoes. Keep in mind that anything you have at home can be replaced at your destination with just one short shopping trip. Keep that in mind and you’ll be less inclined to over pack. Once your clubs are packed, if you haven’t secured your accommodations yet you’d better do so. Check us out at Myrtle Beach Golf — we’re the KING of Myrtle Beach golf and can find you not just the most comfortable accommodations but also the best Myrtle Beach golf packages in the area. If you’d like to speak with one of our reservationists just give MBGolf a call at 800-422-1587 today! This entry was posted in Myrtle Beach Golf Packages and tagged myrtle beach golf clubs, myrtle beach golf packages, shipping golf clubs. Bookmark the permalink.